Interested in Growing Green Beans? Sit back and relax. You've come to the right place. Growing green beans really is easy. In fact, they are one of the easiest vegetables to grow. Green bean plants don't take up a lot of space. They require very little maintenance. And the best part is - as long as you keep picking and the growing conditions are favorable, the plants keep producing. Green beans are appropriate for both container and traditional vegetable gardens. The beans themselves are usually 6-9 inches long, depending on the variety. Most varieties are ready to be harvested 50-65 days after planting. Bush bean plants grow just as the name suggests - like a bush. They reach 18-36 inches tall and require no support structure. Bush beans can be sowed in rows 30" apart so they take up relatively little garden space. They are also easy to plant. However, bush beans generally produce beans for a shorter period of time. Pole bean plants need some sort of support structure - like a pole. A fence, trellis or cage will also work well. Their height is limited by the height of the support structure. Most people use support structures that are no more than 6-7 feet tall, as a ladder may be required to pick beans higher than that. Pole beans generally produce right up until the first frost arrives, as long as you continue to pick them. Pole beans are planted in mounds 3 feet apart, so they require more garden space. They also take more time to plant because you have to create the mounds and set up the support structure. If you have limited time and garden space, bush beans are probably the way to go. If you have more time and garden space, pole beans will produce a larger crop over a longer period of time. Most varieties of green beans are available in bush or pole plant types. This also includes purple and yellow bean varieties. These different colored beans are grown the same as green beans and usually have a similar taste. 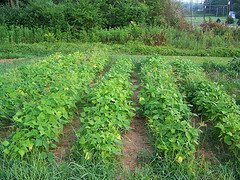 To avoid having a large crop of beans that is ready for harvest all at one time, you can stagger your plantings over several weeks. For instance, if you plan on growing green beans and have room for 6 rows, plant 2 rows first. Then wait 2 weeks and plant another 2 rows. Plant the remaining 2 rows after another couple of weeks. The same principle can be applied to pole beans. By staggering your planting time, you will have a continuous supply of beans. However, if you are interested in canning your green beans, it's usually better to plant a bunch at one time. This way, the harvest comes all at once, and you'll have plenty of beans to load up enough jars to fill the canner. Green beans require at least 6-8 hours of daily direct sunlight and well-tilled, well-drained soil. They are also well suited to container gardening. 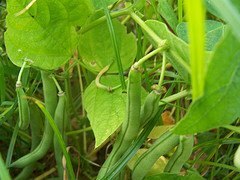 Click on the following links for more information about growing green beans. Questions About Growing Green Beans?